Based on a monochrome photograph, this is an attempt to re-imagine this lost painting. 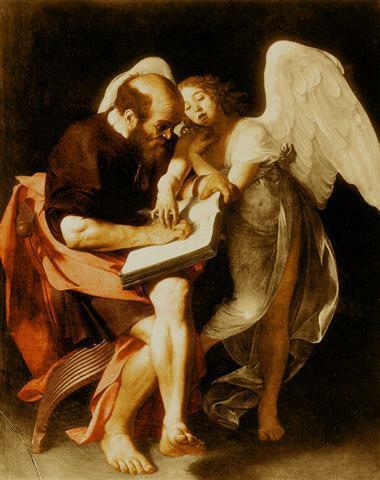 Garavaggio has, as have other artists, chosen to portray an angel alongside St. Matthew. By depicting the angel guiding Matthew’s hand, the artist seeks to emphasize the divine inspiration of the Gospel’s content. The frequent portrayal, of St. Matthew accompanied by an angel, comes from a tradition of associating each of the gospel writers with one of the four spiritual beings that, in the Bible, intimately attended the throne of God. Portrayed as four living creatures, one was like an ox, one like a lion, one like an eagle and one with the face of a man (Ezek 1:10, Rev 4:7). The human faced creature, was the one most often associated with Matthew. Eventually, some of those who had witnessed Jesus’ miraculous signs and listened to his teaching, or had received the particulars by word of mouth, began to commit the details to writing. Amongst those early documents was Matthew’s Gospel. Similar teaching also found its way into the other synoptic gospels, Mark and Luke, and non-canonical works such as the Gospel of Thomas. It is likely that Jesus delivered the Sermon in Aramaic, the language of his countrymen, though, many would have been equally conversant with Greek. Early traditions suggest that an Aramaic version of Matthew’s Gospel preceded the Greek version with which we are now familiar (for more on this see Chapter 1 of The Emmaus view) . The three synoptic gospels share a similar view (or synoptic) of Jesus’ ministry. However, for most of the Church’s history, its academics accepted the tradition that the apostle Matthew produced the first Gospel. Matthew’s Gospel, being also the longest of the synoptic gospels, was therefore given prominence over the others. It would be nice if the study of internal evidence could confirm that Matthew was written first, but the evidence is ambiguous, with each synoptic gospel appearing, to some extent, dependent upon the other two. The conundrum of sorting out their relationships has become notorious amongst bible scholars, who refer to it as the synoptic problem. the Griesbach hypothesis, which places Matthew first, derives Luke from Matthew and then Mark from Luke. The two-source hypothesis became very popular in the twentieth century, but, as its under-girding assumptions come under increasing scrutiny, that popularity seems to have past its zenith. Meanwhile, the Griesbach hypothesis, which it formerly eclipsed, is now regaining ground in a variant known as the two-gospel hypothesis. The two-source hypothesis requires that an editor, probably in the early post-apostolic church, crafted the Sermon from a range of previously unconnected sayings. Yet, the nature of the Sermon, with its coherent and multi-layered message, targeted at an authentically Jewish audience and closely addressing the particular circumstances of Jesus’ earliest ministry, would seem to argue strongly against this. By contrast, the two-gospel hypothesis requires no such process of fragmentation and later re-integration. It also allows the Sermon to pass into Matthew’s Gospel as the single entity that it appears to be. As the gentile church expanded, the Greek version of Matthew found its way into the public domain and became the preferred version of that gospel.